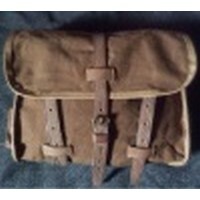 Incredible WW 2 equipment pouch. Fantastic condition, no storage marks, tears, scrapes, rust, fading, mould . . . . . AWESOME !! Just that beautiful historical smell . . . that unique 'been there' smell !! Thank You !! Excellent unissued condition. No rust on the hardware. Crisp, unfaded lettering. M1938 wire cutters fit perfectly. That's no surprise since that's what the case was made to carry. What was a surprise was the fast shipping - arrived in two days! The Danish wire cutters fit this original carrying case perfectly,like they were made for each other! I couldn''t believe how well this pouch looked, like brand new. No rust marks no decaying. great color, fabulous I recomend this for anyone having a hard time finding a wirecutter pouch. The US M1938 Wirecutters (Postwar Danish copy)fit perfectly in it. I'm glad I got them for that special item for my load-out.